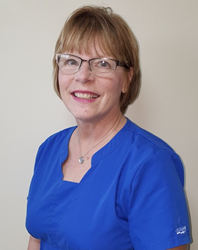 Janet Peabody, 58, a resident of Belvidere, Illinois, was recently named the first 2018 True Blue Alum by Ultimate Medical Academy. Peabody earned her high school diploma at night school, spent 25 years in banking, and 10 years as a veterinary technician, before earning her associate degree from Ultimate Medical Academy in 2012 and beginning a career in healthcare. Janet Peabody is Ultimate Medical Academy's first 2018 True Blue Alum. She started healthcare career in 2012 at after 25 years in banking and 10 years as a Vet Tech. Janet Peabody, 58, a resident of Belvidere, Illinois, was recently named Ultimate Medical Academy's first 2018 True Blue Alum. This recognition is awarded each quarter by the accredited nonprofit school to graduates who are serving their communities, excelling in their careers, and accomplishing other noteworthy achievements. Peabody earned her high school diploma at night school, spent 25 years in banking, and 10 years as a veterinary technician, before graduating from Ultimate Medical Academy in 2012. For the past six years, she has played an integral role in the success of a Belvidere healthcare provider. Peabody began working for New Millennium Medical, 1424 N. State St.- previously Belvidere Family Chiropractic - as a receptionist in March 2012, the same month that she received a diploma in Medical Billing and Coding from Ultimate Medical Academy. While working, Peabody continued her online education and earned her associate degree from Ultimate Medical Academy in September 2012. She has been instrumental in New Millennium Medical's growth: from expanding their services, to implementing new practice management software, to rebranding the practice, and moving from a 1,000-square-foot office to a 3,000-square-foot office, and more. "In addition to how Janet has helped us grow and modernize New Millennium Medical, her morals and patient advocacy are the top qualities that resonate with those who work here and those we treat," Dr. Chris Parrett said. Peabody said, "When I started it was just the two of us, the chiropractor (Dr. Parrett) and myself, running the office. In early 2014, I was promoted to office manager and we started to grow. Soon after, I successfully assisted in converting the chiropractic office into a medical office with a staff of 11." Not only does Peabody enjoy her healthcare career, she also enjoys developing relationships with the local community. The office hosts many events to provide educational seminars to local residents. For Peabody, the office's 2017 children's sock drive for a local homeless shelter was especially touching. Peabody remembers how hard her Career Services advisor at Ultimate Medical Academy worked to help find her the right job. After graduating, she thought going on interviews would be easy, but she didn't realize how much everything had changed since she originally began her career in banking. "I used UMA for everything that they had available-and they're great," Peabody said. "I have nothing but the greatest things to say about UMA. Everyone was positive, everyone was supportive. It was the best experience that I've had." Peabody has the same dream for the future that she had when Dr. Parrett interviewed her in 2012. During her interview, he asked her where she saw herself in five years. She responded, "Seeing your practice grow and helping you grow it." When asked today where she sees herself in five years, she said, "Right here." "We are so proud of Janet and everything she has accomplished, both professionally and within her community," Ultimate Medical Academy President Derek Apanovitch said. "She is a true example of our mission to equip and empower students to excel in healthcare careers."